The flat track playoff season will look a lot more sparse in 2017, as the WFTDA has announced a new, trimmed-down format for its year-end tournaments. The changes are significant: Three Division 1 playoff weekends instead of four. A single Division 2 combined playoff and championship weekend. Eight fewer teams will be playoff-bound, and several more will play fewer games. Some the most competitive bouts of the playoffs will not be live-streamed on video. Why the contractions? Why else? Money. 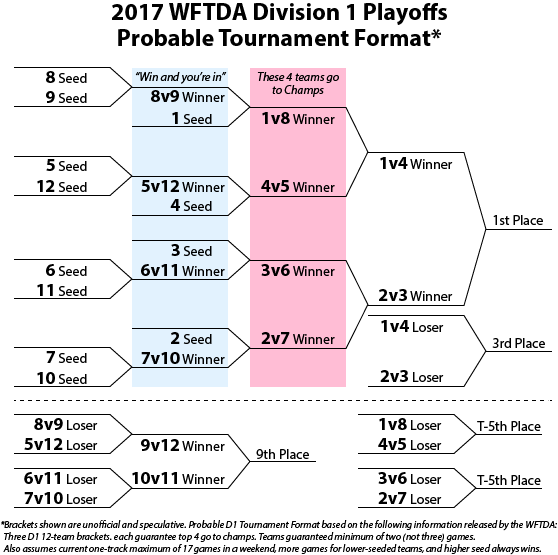 The new format will see the top 36 teams in the WFTDA seeded into three Division 1 playoff tournaments of 12 teams each. A consequence of this format means that teams will only be guaranteed two games, down from the three they received under the previous 10-team divisional format. The top four teams from each of three three tournaments, 12 altogether, will advance to an expanded WFTDA Championships. What the WFTDA Division 1 tournament brackets might look like under the new 12-team format. The most significant changes are in Division 2. The next-highest 16 teams not making it into Division 1 will all come together August 18-20 in Pittsburgh, Penn. for a single mega-tournament to determine the Division 2 Champion right then and there. The D2 finalists will not get to play with the D1 finalists at WFTDA Championships as they have in previous years. In related news, the WFTDA has yet to announce if its streaming partnership with ESPN3 will continue on into 2017. The initial two-year agreement has expired, meaning a new deal would need to be structured if playoff roller derby is to continue being shown on the ESPN platform. The original deal was announced in August of 2015; if the arrangement is to continue, we would expect to hear about it in the summer or sooner. All told, the changes to the playoffs means that eight fewer WFTDA member leagues will be able to go to the playoffs and at least six more leagues will play one less postseason game than before. As well, the reduction in broadcast coverage means the Division 2 games, which have proven to reliably produce the closest and most exciting finishes, will not be seen by derby fans outside of Pittsburgh. With these changes, the WFTDA is hoping to focus its resources to other areas it deems more important to grow the game out. For example, the association cites the upcoming Roller Derby World Summit in Manchester, England as part of its “plan to build more education resources” in the places that might need it more than the community needs to see playoff roller derby games over the internet. Still, this news will come as a disappointment to many fans. The WFTDA had been building up and expanding its broadcast coverage through its WFTDA.tv platform, including having the championships final on ESPN3. Derbyfolk have had to put up with increasing costs every year of the outgoing seven-tournament format. It seems that wasn’t enough to continue broadcasting from that many locations while simultaneously ensuring at the bigger picture of developing the sport worldwide was properly backstopped. The WFTDA is taking this week to slowly roll out announcements of the dates and locations of its five playoff tournaments, including the site of the 2017 WFTDA Championships. This story will be updated with that information once it becomes fully available. I wonder when leagues in the bottom quintile tell the “cool kids” off and join USARS?